Grace Field House is an orphanage, and life there is just peachy, or it seems so... This is especially true for the orphanage's three brightest children: Emma, Norman, and Ray, who are all 11-years-old. While there is daily studying and exams, there is also delicious food and plenty of playtime. However, the children's loving, but stern caretaker, “Mom,” hides the fact that everything is not what it seems. As The Promised Neverland, Vol. 8 (entitled The Forbidden Game; Chapters 62 to 70) opens, Emma and Ray continue their journey to A08-63, where they will supposedly meet William Minerva, the author of a secret guide book the children found at Grace. Their companion is “the Man,” and now, Emma believes that she has learned his secret. But there is a bigger secret – a forbidden game, and Emma will find herself caught in it. 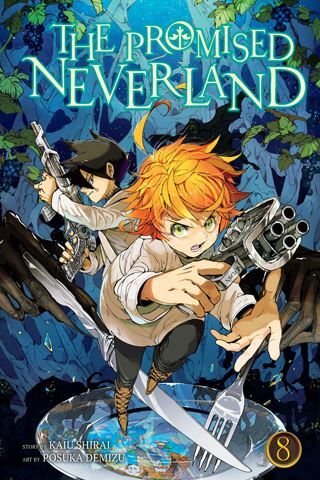 THE LOWDOWN: The Promised Neverland manga continues to be one of the best graphic novels currently available. It reads like classic dystopian, young adult fiction, but its dark mood cannot eclipse the series' hopeful vibes. All this I say in each of my reviews of this series. The Promised Neverland Graphic Novel Volume 8 raises the stakes higher than Vol. 7, which was a stakes raiser. I don't want to exaggerate, but Vol. 8 really seems to change the direction of the narrative. If you are a regular reader of this series, writer Kaiu Shirai and artist Posuka Demizu have given you the equivalent of a Christmas gift. And translator Satsuki Yamashita is doing excellent work creating a comic book that is a delight to read. I READS YOU RECOMMENDS: Readers of dark fantasy graphic novels will find a terrifying story in Shonen Jump's The Promised Neverland.